Big House ~ Small House. Choices…. The bigger the home, the bigger the mortgage ~ As the saying goes “You get what you pay for”! Most likely your mortgage payments will be higher for a bigger home than for a smaller home. BUT, a smaller home with more amenities is sometimes not that far off in price from a larger home that gives you a bit more square footage. Choices…. Think about if you are planning to stay in the home a long time ~ If so, getting a bit more square footage now might be better than having to move again in a short period of time when you may outgrow the home. 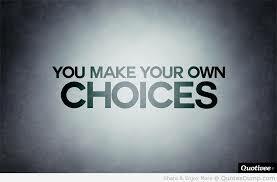 Choices…. Decide how much home you’re willing to maintain ~ For instance, do you want the responsibility of a big back yard or do you want to have something in an association, like a condo, where there is limited yard space but much more time on your hands and less work on the weekends! Choices…. Do you work from home or might you someday ~ More and more people are working from home and trust me, setting up desk space on the dining room table is not optimal. If you think you might be working from home someday, either occasionally or full time, it’s best to look for a home now that will give you the option of a dedicated work/office space. If you really want a bigger home but aren’t sure you can afford it, think outside the box. Can you get a roommate for a bit to ease you into it? Increasing your income is always a good goal, but can you decrease your debt in the meantime? Weighing that dinner and a movie once a week over homeownership now is up to you. Choices…. So the choice is yours….! !